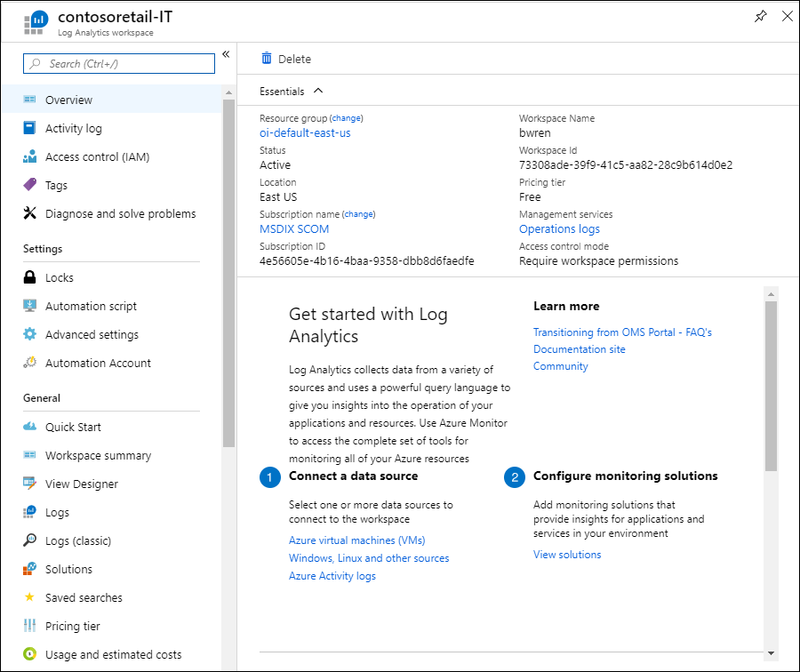 Azure Monitor stores log data in a Log Analytics workspace, which is essentially a container that includes data and configuration information. To manage access to log data, you perform various administrative tasks related to workspaces. You or other members of your organization might use multiple workspaces to manage different sets of data that is collected from all or portions of your IT infrastructure. This article explains how to manage access to logs and to administer the workspaces that contain them. Associate the workspace with one of your subscriptions and resource groups. A Log Analytics workspace is an Azure resource and is a container where data is collected, aggregated, analyzed, and presented in Azure Monitor. You can have multiple workspaces per Azure subscription, and you can have access to more than one workspace, with the ability to easily query across them. This section describes when it can be helpful to create more than one workspace. A geographic location for data storage. Data isolation to define different user access rights in workspace-centric mode. Not relevant when working in resource-centric mode. Scope for configuration of settings like pricing tier, retention and data capping. Charges related to data ingestion and retention are made on the workspace resource. You are a global company and you need log data stored in specific regions for data sovereignty or compliance reasons. You are using Azure and you want to avoid outbound data transfer charges by having a workspace in the same region as the Azure resources it manages. You are a managed service provider and need to keep the Log Analytics data for each customer you manage isolated from other customer’s data. You manage multiple customers and you want each customer / department / business group to see their own data, but not data from others, and there is no business need for a consolidated cross customer / department / business group view.”. When using Windows agents to collect data, you can configure each agent to report to one or more workspaces. If you are using System Center Operations Manager, each Operations Manager management group can be connected with only one workspace. You can install the Microsoft Monitoring Agent on computers managed by Operations Manager and have the agent report to both Operations Manager and a different Log Analytics workspace. Once the workspace architecture is defined, you should enforce this policy on Azure resources with Azure Policy. This can provide a built-in definition that would automatically apply to all Azure resources. For example, you could set a policy to ensure that all your Azure resources in a particular region sent all their diagnostic logs to a particular workspace. While you analyze data in your Log Analytics workspace from the Azure Monitor menu in the Azure portal, you create and manage workspaces in the Log Analytics workspaces menu. Sign in to the Azure portal and click All services. In the list of resources, type Log Analytics. As you begin typing, the list filters based on your input. Select Log Analytics workspaces. Select your workspace from the list. The workspace page displays details about the workspace, getting started, configuration, and links for additional information. The data that a user has access to are determined by multiple factors that are listed in the following table. Each is described in the sections below. Access mode Method that the user uses to accesses the workspace. Defines the scope of the data available and the access control mode that's applied. Access control mode Setting on the workspace that defines whether permissions are applied at the workspace or resource level. Permissions Permissions applied to individual or groups of users for the workspace or resource. Defines what data the user will have access to. Table level RBAC Optional granular permissions that applies to all users regardless of their access mode or access control mode. Defines which data types a user can access. The access mode refers to how a user accesses a Log Analytics workspace and defines the scope of data they can access. Workspace-centric: In this mode, a user can view all logs in the workspace that they have permissions to. Queries in this mode are scoped to all data in all tables in the workspace. This is the access mode used when logs are accessed with the workspace as the scope, such as when you select Logs from the Azure Monitor menu in the Azure portal. Resource-centric: When you access the workspace for a particular resource, such as when you select Logs from a resource menu in the Azure portal, you can view logs for only that resource in all tables that you have access to. Queries in this mode are scoped to only data associated with that resource. This mode also enables granular role-based access control (RBAC). You can test if logs are properly associated with their resource by running a query and inspecting the records you're interested in. If the correct resource ID is in the _ResourceId property, then data is available to resource-centric queries. Who is each model intended for? Central administration. Administrators who need to configure data collection and users who need access to a wide variety of resources. Also currently required for users who have to access logs for resources outside of Azure. Application teams. Administrators of Azure resources being monitored. What does a user require to view logs? Permissions to the workspace. See Workspace permissions in Manage accounts and users. Read access to the resource. See Resource permissions in Manage accounts and users. Permissions can be inherited (such as from the containing resource group) or directly assigned to the resource. Permission to the logs for the resource will be automatically assigned. What is the scope of permissions? Workspace. Users with access to the workspace can query all logs in that workspace from tables that they have permissions to. See Table access control Azure resource. User can query logs for resources they have access to from any workspace but can't query logs for other resources. How can user access logs? Start Logs from Azure Monitor menu or Log Analytics workspaces. Start Logs from the menu for the Azure resource. The Access control mode is a setting on each workspaces that defines how permissions are determined for that workspace. Require workspace permissions: This control mode does not allow granular RBAC. For a user to access the workspace, they must be granted permissions to the workspace or to specific tables. If a user accesses the workspace in workspace-centric mode, they will have access to all data any tables that they've been granted access to. If a user accesses the workspace in resource-centric mode, they will have access to only data for that resource in any tables that they've been granted access to. This is the default setting for all workspaces created before March 2019. Use resource or workspace permissions: This control mode allows granular RBAC. Users are be granted access to only data associated with resources they can view through Azure permissions, resources for which they have read permission. When a user accesses the workspace in workspace-centric mode, workspace permissions will apply. When a user accesses the workspace in resource-centric mode, only resource permissions will be verified, and workspace permissions will be ignored. Enable RBAC for a user by removing them from workspace permissions and allowing their resource permissions to be recognized. This is the default setting for all workspaces created after March 2019. If a user has only resource permissions to the workspace, they will only be able to access the workspace using Resource-centric mode. You can view the current workspace access control mode on the Overview page for the workspace in the Log Analytics workspace menu. You can change this setting on the Properties page for the workspace. Changing the setting will be disabled if you don't have permissions to configure the workspace. To configure the access mode in an Azure Resource Manager template, set the enableLogAccessUsingOnlyResourcePermissions feature flag on the workspace to one of the following values. false: Set the workspace to workspace-centric permissions. This is the default setting if the flag isn't set. true: Set the workspace to resource-centric permissions. The permissions to the workspace that are applied to a particular user are defined by their access mode and the access control mode of the workspace. Workspace permissions are applied when a user accesses any workspace using workspace-centric in workspace-centric mode. Resource permissions are applied when a user accesses a workspace with Use resource or workspace permissions access control mode using resource-centric mode. Each workspace can have multiple accounts associated with it, and each account can have access to multiple workspaces. Access is managed via Azure role-based access. Microsoft.Resources/deployments/*/write These permissions need to be granted at resource group or subscription level. To grant access to the Log Analytics workspace using Azure permissions, follow the steps in use role assignments to manage access to your Azure subscription resources. View monitoring settings, including viewing the configuration of Azure diagnostics on all Azure resources. In order to successfully perform the last two actions, this permission needs to be granted at the resource group or subscription level. You can use the ability to add a virtual machine extension to a virtual machine to gain full control over a virtual machine. To add and remove users to a user role, it is necessary to have Microsoft.Authorization/*/Delete and Microsoft.Authorization/*/Write permission. You should perform assignments at the resource level (workspace) to assure accurate access control. Use custom roles to create roles with the specific permissions needed. Microsoft.Insights/logs/Heartbeat/read Ability to view all log data for the resource. This permission is usually granted from a role that includes */read or * permissions such as the built-in Reader and Contributor roles. Note that custom roles that include specific actions or dedicated built-in roles might not include this permission. See Defining per-table access control below if you want to create different access control for different tables. Table level RBAC allows you to provide more granular control to data in a Log Analytics workspace in addition to the other permissions. This control allows you to define specific data types that are accessible only to a specific set of users. You implement table access control with Azure custom roles to either grant or deny access to specific tables in the workspace. These roles are applied to workspaces with either workspace-centric or resource-centric access control modes regardless of the user's access mode. Create a custom role with the following actions to define access to table access control. To grant access to a table, include it in the Actions section of the role definition. To deny access to a table, include it in the NotActions section of the role definition. Use * to specify all tables. Custom logs are created by data sources such as custom logs and HTTP Data Collector API. The easiest way to identify the type of log is by checking the tables listed under Custom Logs in the log schema. If a user is granted global read permission with the standard Reader or Contributor roles that include the */read action, it will override the per-table access control and give them access to all log data. If a user is granted per-table access but no other permissions, they would be able to access log data from the API but not from the Azure portal. To provide access to the Azure portal, use Log Analytics Reader as its base role. Administrators for the subscription will have access to all data types regardless of any other permission settings. Workspace owners are treated like any other user for per-table access control. You should assign roles to security groups instead of individual users to reduce the number of assignments. This will also help you use existing group management tools to configure and verify access. See Log Analytics agent overview to gather data from computers in your datacenter or other cloud environment. See Collect data about Azure Virtual Machines to configure data collection from Azure VMs.